This popular bread is made mostly during Navaratri/Dussera fasting (vrat). Made of Buckwheat (Kuttu flour) & Potatoes, these are fried to make crispy puris. Popular pudding made using Sago enjoyed especially during Navaratri (dussera) Vrat/Fasting. Can be made for all festivals and special occasions. One of the most popular recipes during Navaratri (Dussera) Vrat/ fasting, this savory pudding is made from Sago, potatoes & peanuts. Minimally spiced & hearty. A popular snack from Maharashtra enjoyed especially during the Dussehra / Navaratri Vrat (fasting) days. Made from Sago, Potatoes and Peanuts. 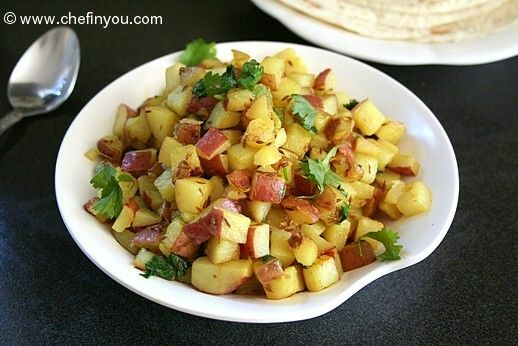 Cubed potatoes roasted along with cumin and other Indian spices. 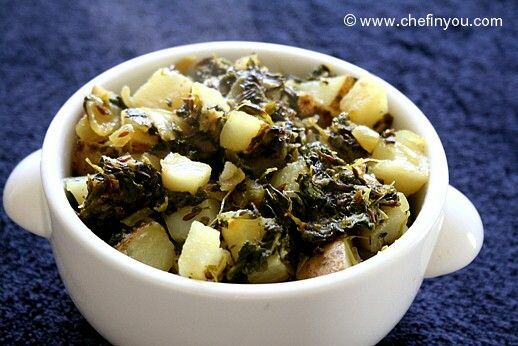 Simple Indian side dish made with lightly bitter fenugreek leaves & cubed potatoes. Seasoned with aromatic spices it is one of the simplest dishes to make. Most Discussed Under "Navratri Fasting Recipes"